Sometimes a gift appears in disguise and our challenge is to recognize the little miracle that has just fallen into our lap. This is the story of the gift that became Prairie Kaddish (Coteau Books), a book of history told mostly through poetry. A book that began in an obscure corner of Jewish history, a tattered scrap of time, and unfolded as a generous, intricate tapestry in which, unbeknownst to me, my history was also stitched. This story begins in 2003. I was on my way to a writers’ workshop in a monastery near Regina, Saskatchewan. A friend in Victoria, Linda Doctoroff, suggested I might be interested in visiting the Lipton Hebrew Cemetery, which was not far away. Some of her ancestors who had come to Saskatchewan to farm in the early 1900s were buried in Lipton. Jewish farmers in Saskatchewan? I had lived in Canada for nearly 30 years, yet never knew this history. Mostly, I had lived in Montreal, and the Canadian history I knew was all about Quebec and Ontario, where the country’s social and political memory are concentrated. Since moving to British Columbia, my appreciation of the west had grown substantially, but my ignorance of Canada’s regional history remained. I made it my mission to visit this cemetery, unaware that my life was about to change, that I was to undertake a prairie pilgrimage through the fields and towns of Saskatchewan and then reach back in time, roughly 150 years, to my family’s history and the Europe where my parents came from. Between 1880 and World War I, one in three Jews left Eastern Europe to escape persecution. Every New World Jew had relatives back home; those were my parents’ parents. My parents were among the lucky few who survived the Shoah and came to North America a half century later, in 1950. I set off in search of the town of Lipton with Diane Buchanan, a fellow poet who was intrigued by my invitation. Finding the cemetery was a bit of a challenge. It was actually somewhere beyond Lipton, in the middle of a field, in the middle of nowhere. When we arrived we opened the gate and were stunned to find a variety of little houses with gabled roofs built atop the graves. As we walked through the rows, noting the graves with the familiar stone markers, my companion, who was not Jewish, kept asking questions: Why these grave-houses? How do Jews bury their dead? What did the Hebrew inscriptions carved on the headstones mean? Do Jews believe in an afterlife? As I struggled with the answers, I realized that I knew virtually nothing about Jewish death and burial practices. And I was a yeshiva girl who had attended the Maimonides School in Boston. Embarrassed by my ignorance, I explained it away by telling her that my father was a kohen, so we did not frequent cemeteries, and besides, my survivor parents had no graves to visit. Although death permeated our lives, we didn’t discuss it, nor were we initiated into its customs. 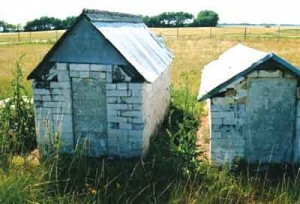 But as ignorant as I was, I knew the grave-houses were unique, foreign to Jewish cemeteries in North America. We entered a little unlocked shed that served as the cemetery’s office and unofficial museum, complete with the original iron bath for washing the dead, a litter for carrying them and a guestbook for visitors to sign. A world map tacked on the wall invited visitors to place a thumbtack to mark their country of origin. We also found a loose-leaf binder filled with tantalizing fragments about the Romanian and Russian Jews who arrived in Lipton circa 1901. According to the notes, settlers had each bought 160 acres, a quarter section, for $10, with the stipulation that the land was theirs to keep if they lived on it a minimum of 6 months a year over 3 years and broke 30 acres. Most had no experience of farming. They arrived to no visible civilization. The prairie grasses had never been plowed. and spit out by the cold. my finger bones, ivory needles. All I wanted was to be warm. I involved myself in the story of Jewish immigration to the Canadian west. With a grant from the Canada Council for Arts, I was able to research the history of this migration. I became more impressed by the phenomenal challenges the immigrants faced as well as the strength of Jewish tradition that held the Jews together despite the living arrangements that prevented a community from developing. People had to live on their quarter sections and had to walk miles, sometimes a couple of days, to see a neighbor. Some settlers never even lived near a Jewish colony—they bought their quarter sections where they could, struggling on their own. I returned to Saskatchewan to visit the six Jewish colonies established there (they were abandoned, but the cemeteries remain). I learned about the remarkable contributions of Baron Maurice and Baroness Clara de Hirsch. Without their desire to rescue the Jews of the Pale after the 1881 assassination of Czar Alexander II—when the word pogrom was coined (from the Russian pogromu, meaning devastation) and more than 200 Jewish communities were massacred—these Canadian colonies would not exist. (Neither would those in the United States, such as Alliance and Woodbine in New Jersey, and others in North Dakota, or those in South America, such as Moisesville in Argentina.) Nor would Jewish history be the same: There would be far fewer of us. My research brought me in contact with the native Cree and Metis people (who share French-Canadian and Cree ancestry). I learned of their stories, traditions and tragedies and they touched my heart. From them I found the answer to the mystery of the grave-houses. Although the Cree had been moved onto reserves by the time the Jews arrived, those reserves were close to Lipton. The two peoples must have interacted. How else could the Jews have survived? Anthropologist David Mandelbaum wrote about the Cree in his 1936 study. His map showed their reserves in the Qu’Appelle Valley, near Lipton, and he described their practice of erecting “small gable-roofed board houses over the graves.” When I discovered an 1885 photo of a Cree cemetery full of wooden grave-houses, I was so excited. But, most of all, engaging in this work deepened my appreciation of my own precious heritage. It spurred me to probe my mother’s memories. Sabina Kramer Milman recalled her childhood with aching clarity and re-created for me that time and place. Together, we spoke and read the immigrant language, our language—Yiddish. Beyond tears, we laughed at the exploits we encountered in the memoirs and, best of all, we strengthened our own connections and understanding of our history and our people. It was her final gift to me; she died in April 2007. Isa Milman lives in Victoria, British Columbia. Her book, Prairie Kaddish (Coteau Books), won the 2009 Canadian Jewish Book Award for poetry.